Editorial: Should all clinical trials of oral health be registered? Background: Autologous platelet concentrates are claimed to enhance hard and soft tissue healing due to the considerable amount of growth factors that are released after application in the surgical site. However, their actual efficacy for improving tissue healing and regeneration in oral surgery applications is controversial. Tooth extraction socket healing represents a proper model to study the effect of autologous platelet-enriched preparations due to the concomitant occurrence of different processes of both hard and soft tissue healing. Purpose: To evaluate the efficacy of platelet concentrates for alveolar socket healing after tooth extraction, by conducting a systematic review. Materials and methods: Medline, Embase and Cochrane Central Register of Controlled Trials were searched using a combination of specific search terms. The last electronic search was performed on 15 June, 2014. Manual searching of the relevant journals and of the reference lists of reviews and all identified randomised controlled trials was also performed. Randomised controlled trials evaluating the effect of a platelet concentrate on fresh extraction sockets were included. Further inclusion criteria were that at least 10 patients were treated (at least 5 per group) and there was a minimum follow-up duration of 3 months. Primary outcomes were postoperative complications, patient satisfaction and postoperative discomfort. Secondary outcomes were any clinical, radiographic, histological and histomorphometric variables used to assess hard and soft tissue healing. Assessment of the methodological quality of the trials was made. Results were expressed as fixed-effects models using mean differences for continuous outcomes and risk ratios for dichotomous outcomes, with 95% confidence intervals (CI). Results: The initial search yielded 476 articles. After the screening process, six articles met the inclusion criteria (199 teeth in 156 patients). Three studies were considered at high risk of bias, two at medium risk and one at low risk. A large heterogeneity in study characteristics and outcome variables used to assess hard tissue healing was observed. A meta-analyses of two studies reporting histomorphometric evaluation of bone biopsies at 3 months' follow-up showed greater bone formation when platelet concentrates were used, as compared to control cases (P <0.001; mean difference 20.41%, 95% C.I. 13.29%, 27.52%). Beneficial effects of platelet concentrates were generally but not systematically reported in most studies, in particular when considering the effects on soft tissue healing and the patient's reported postoperative symptoms like pain and swelling, although no meta-analysis could be done for such parameters. Conclusions: Although the results of the meta-analysis of the present review are suggestive for a positive effect of platelet concentrates on bone formation in post-extraction sockets, due to the limited amount and quality of the available evidence, they need to be cautiously interpreted. A standardisation of the experimental design is necessary for a better understanding of the true effects of the use of platelet concentrates for enhancing post-extraction socket healing. Conflict of interest statement: The authors declare they have no conflicts of interest. Background: An oroantral communication (OAC) is a common complication in alveolar surgery that usually occurs as a result of the extraction of maxillary posterior teeth. To avoid further complications, several closure techniques are used; most of them need a flap elevation. Recently, simpler conservative flapless techniques for OAC closure have been described. Objectives: To appraise the effectiveness of different techniques for closure of OACs also in comparison to nothing. Search methods: The following electronic databases were searched for randomised controlled trials regarding techniques for closure of OACs: PubMed; SciVerse Scopus; Latin American and Caribbean Health Sciences; The Scientific Electronic Library Online and The Cochrane Library (from January 1949 to August 2014). Unspecific algorithms were chosen in order to maximise search sensibility. Additional manual searching was performed in PubMed related citations, in five journals and in the references of the selected articles. There were no restrictions with regard to publication language. Selection criteria: Randomised controlled trials (RCTs) comparing techniques for closing oroantral communications to nothing, or different techniques for closing oroantral communications reporting the success rate with at least two months follow-up. Data collection and analysis: The screening of eligible studies, the assessment of methodological quality and data extraction were done by two independent reviewers working in duplicate. Results: The research individuated 1256 publications. After screening, only five articles were assessed for eligibility. Only two RCTs evaluating the effectiveness of techniques for OAC closure fulfilled the inclusion criteria of the present review. One trial including 30 patients assessed whether flapless techniques (resorbable root analogues and haemostatic gauze) could be as effective as the Rehrmann's buccal flap; all the patients were reported as successfully healed in the three intervention groups. Another RCT with 20 patients compared the effectiveness of the buccal fat pad flap (100% success rate) with a sandwich graft with hydroxyapatite crystals within collagen sheaths (90% success rate). The authors found no significant difference. Conclusions: There are no RCTs evaluating whether an oroantral communication should be closed or not. 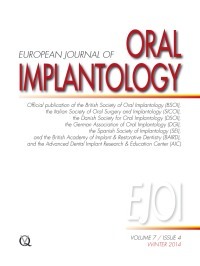 There is weak evidence from two RCTs showing good results with five different techniques for closure of OACs (resorbable root analogues, haemostatic gauze, Rehrmann's buccal flap, buccal fat pad flap, sandwich graft with hydroxyapatite crystals). Until sufficiently high quality RCTs are conducted, elevating or not a flap for closure of OACs will be left to the personal choice of the surgeon. Conflict of interest notification: The authors declare no competing financial interest. Objectives: To evaluate whether 6.6-mm long implants could be a suitable alternative to longer implants placed in vertically augmented atrophic posterior mandibles. Materials and methods: Sixty partially edentulous patients having 7 to 8 mm of residual crestal height and at least 5.5 mm thickness measured on CT scans above the mandibular canal were randomised according to a parallel group design. They were either to receive 1 to 3 submerged 6.6-mm long implants or 9.6 mm or longer implants (30 patients per group) placed in vertically augmented bone. Bone was augmented with interpositional anorganic bovine bone blocks covered by resorbable barriers. Grafts were left to heal for 5 months before implant placement. Four months after provisional acrylic prostheses were delivered, they were replaced, after 4 months, by definitive metal-ceramic prostheses. Outcome measures were: prosthesis and implant failures; complications; and radiographic peri-implant marginal bone level changes. All patients were followed up to 5 years after loading. Results: Five years after loading, 8 patients dropped out: 3 from the short implant group and 5 from the augmented group. The augmentation procedure failed in 2 patients and only 6.6-mm long implants could be inserted. There were no statistically significant differences for prosthesis and implant failures. Five prostheses failed in 4 patients of the short implant group versus 5 prostheses in 5 patients in the augmented group (Fishers exact test P = 1.0; difference in proportions = 0.07; 95% CI -0.29 to 0.43). Five short implants failed in 3 patients versus 3 long implants in 3 patients (Fishers exact test P = 1.00 difference in proportions = 0.00; 95% CI -0.43 to 0.43). There were statistically more complications in augmented patients (25 complications in 21 augmented patients versus 6 complications in 6 patients of the short implant group) (Fishers exact test P < 0.0001; difference in proportions = 0.60; 95% CI 0.38, 0.82). Both groups gradually lost peri-implant bone in a statistically significant way. Five years after loading, short implant group patients lost an average of 1.49 mm peri-implant bone compared with 2.34 mm in the augmented group. Short implants experienced statistically significantly less bone loss (0.82 mm, 95% CI 0.48; 1.16, P < 0.0001) than long implants. Conclusions: When residual bone height over the mandibular canal is between 7 to 8 mm, 6.6 mm short implants could be an interesting alternative to vertical augmentation in posterior atrophic mandibles since the treatment is faster, cheaper and associated with less morbidity. Longer follow-ups may still be needed to confirm these results, however the medium-term prognosis (5 years after loading) of short implants is at least as good as those of longer implants placed vertically in augmented mandibles. Conflict of interest statement: Biomet 3i, manufacturer of the implants used in this investigation, partially supported this trial. However data properties belonged to the authors and by no means did Biomet 3i interfere with the conduct of the trial or the publication of the results. Purpose: To compare the clinical outcome of 6-mm and 10-mm long implants in partially edentulous posterior areas. Materials and methods: Twenty-four patients, with a partially edentulous area in the jaws with a height and width allowing the positioning of 2 to 3 adjacent 10 × 4.1 mm implants without any augmentation procedure, were randomly allocated according to a parallel group design to receive 6-mm long or 10-mm long implants. A total of 54 implants were placed (26 × 6 mm and 28 × 10 mm implants). Patients were restored 8 weeks after surgery and were followed for 5 years. Outcome measures were prosthesis and implant survival, as well as marginal bone level changes and complications. Conclusions: Implant and prosthetic survival and success rates were similar between prostheses supported by 6-mm or 10-mm long implants. Conflict-of-interests statement: The present study was supported by grant 369_2004 from ITI, Basel, Switzerland used to provide free implants and prosthetic components to the patient. Authors declare no conflict of interest. Materials and methods: Fifteen patients with bilateral atrophic mandibles (5 mm to 7 mm bone height above the mandibular canal) and 15 patients with bilateral atrophic maxillae (4 mm to 6 mm bone height below the maxillary sinus), and bone thickness of at least 8 mm, were randomised according to a split-mouth design to receive one to three 5-mm short implants or at least 10-mm long implants in augmented bone. Mandibles were vertically augmented with interpositional bone blocks and maxillary sinuses with particulated bone via a lateral window. Implants were placed after 4 months, submerged and loaded, after another 4 months, with provisional prostheses. Four months later, definitive provisionally cemented prostheses were delivered. Outcome measures were: prosthesis and implant failures; any complication and peri-implant marginal bone level changes. Results: In five augmented mandibles, the planned 10-mm long implants could not be placed and shorter implants (7 mm and 8.5 mm) had to be used instead. Three years after loading, two patients, one treated in the mandible and one in the maxilla, dropped out. Three prostheses (1 mandibular and 2 maxillary) failed in the short implant group versus none in the long implant group. In mandibles, one long implant failed versus two short implants in 1 patient. In maxillae, one long implant failed versus three short implants in 2 patients. There were no statistically significant differences in the failures. Eight patients had 13 complications at short implants (1 patient accounted for 6 complications) and 11 patients had 13 complications at long implants. There were no statistically significant differences in complications (P = 0.63, difference = 0.10, 95% CI from -0.22 to 0.42). Three years after loading, patients with mandibular implants lost on average 1.44 mm at short implants and 1.63 mm at long implants of peri-implant marginal bone. This difference was not statistically significant (difference = 0.24 mm; 95% CI -0.01, 0.49 P = 0.059). In maxillae, patients lost on average 1.02 mm at short implants and 1.54 mm at long implants. This difference was statistically significant (difference = 0.41 mm; 95% CI 0.21, 0.60, P = 0.001). Conclusions: Three years after loading, 5-mm short implants achieved similar results as longer implants in augmented bone. Short implants might be a preferable choice to vertical bone augmentation, especially in mandibles, since the treatment is faster and cheaper, however there are still insufficient data on the long-term prognosis of short implants. Conflict-of-interest statement: MegaGen Implant, Gyeongbuk, South Korea partially supported this trial and donated the implants and prosthetic components, however data properties belonged to the authors and by no means did MegaGen Implant interfere with the conduct of the trial or the publication of the results. Purpose: To compare the clinical effectiveness of two implant systems: Way Milano and Kentron (Geass, Pozzuolo del Friuli, UD, Italy). Materials and methods: A total of 64 patients requiring at least two single crowns or partial fixed dental prostheses supported by a maximum of three implants had their sites randomised according to a split-mouth design to receive both implant systems at six centres. Patients were followed up for 1 year after initial loading. Outcome measures were: prosthesis/implant failures; any complication; peri-implant marginal bone level changes; and clinician preference. Results: In total 71 Way Milano and 73 Kentron implants were placed. Six patients dropped-out before the 1-year follow-up, but all remaining patients were followed up to 1 year post-loading. No Way Milano implant failed, whereas three Kentron implants failed before loading. Two complications were reported, one for each implant type. There were no statistically significant differences for prosthesis/implant failures (difference in proportions = 0.05, P = 0.25; 95% CI -0.02 to 0.13) and complications (difference in proportions = 0, P = 1.0, 95% CI -0.07 to 0.07) between the implant systems. Three operators preferred Way Milano implants whereas the other three had no preference. At implant placement (baseline) bone levels were higher for Way Milano implants (0.27 mm) than for Kentron implants (0.41 mm). Both groups gradually lost statistically significant amounts of periimplant marginal bone at 4 months after loading and at 1 year after loading. One year after loading, Way Milano implants lost an average of 0.73 mm peri-implant bone compared with 0.84 mm of Kentron implants. Marginal bone level changes were not statistically significant different for Way Milano compared to Kentron implants at 4 months (-0.16 mm, 95% CI -0.30, 0.01; P = 0.0606) and 1 year (-0.09 mm, 95% CI -0.26, 0.09; P = 0.3407) after loading. Conclusions: No statistically significant differences were observed between the two implant types, although three Kentron implants failed versus none of the Way Milano type. Longer follow-up of wider patient populations are needed to better understand whether there is an effective advantage with one of the two implant designs. Conflict of interest statement: This trial was partially funded by Geass (Pozzuolo del Friuli, UD, Italy), the manufacturer of the implants evaluated in this investigation. However, the data belonged to the authors and by no means did the manufacturer interfere with the conduct of the trial or the publication of the results. This section presents a brief review of articles on dental implants considered of special interest for the reader in order to encourage the development of research, interest in data analysis and attention to scientific publications. Your comments are welcome. Please contact Dr Michele Nieri at: michelenieri@gmail.com.